Linda Mason, who handles Jasper's municipal court clerk duties as well as property taxes and business licenses, talks about city employees' unhappiness with a change in retirement plans during the April meeting of the Jasper Board of Mayor and Aldermen. City employees, frustrated with the lump sums they are set to receive from the Nationwide plan, worked together to come up with a proposal for the town's leaders. 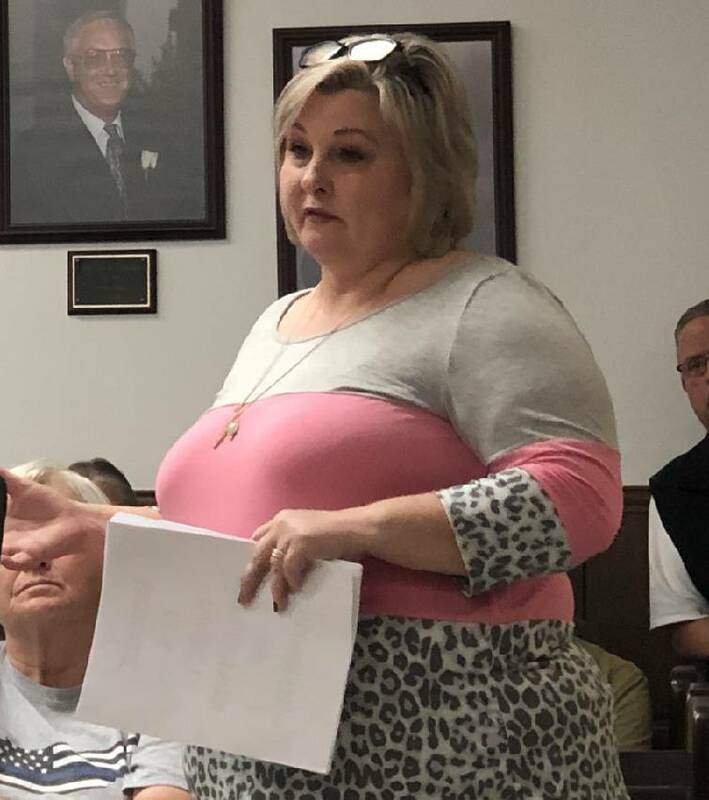 At the Jasper Board of Mayor and Aldermen's April meeting, Linda Mason, who handles Jasper's municipal court clerk duties as well as property taxes and business licenses, said the reason almost 30 city employees showed up at the meeting was simple. "We, as employees, have been faithful to the town of Jasper," she said. "For years, through the best and the worst of times, when budgets have been tight, when budgets have been plentiful, we've been here." Mason said employees were recently "disappointed to say the least" about the results of the town's switch to the TCRS. Employees understand why the board had to make the move, she said, but it doesn't benefit those older workers. Mason said she knows the current leadership had nothing to do with getting Jasper in the pension plan mess it found itself in over a year ago. "But you are here now, and we expect you to care for the employees," she said. Jasper's workers proposed the board fund a "longevity bonus" to help them with retirement. According to the proposal, six Jasper workers who have been on the job for 30 or more years would get $100,000 each from the town. Employees with 20 to 29 years of service would get $75,000 each, those with 10 to 19 years would get $50,000 each, and those with less than 10 years would get $1,000 for each year worked. The total amount requested would cost Jasper $1.477 million. "You've got a lot of people that have been faithful to you, and I feel like those people deserve to be taken care of, even though it's no fault of your own," Mason told the board. "It is your responsibility now to step up to the plate and do what's right." City Attorney Mark Raines said even though the employee proposal doesn't directly address the retirement plan, it's "tied into it by the fact that it's compensation for employees looking to retire." He said the "best action" the board could take for now would be to consider the employees' request and examine whether or not it's even allowed by law. "Not to mislead the employees or anything, but this is a huge sum, and [Jasper] is already having to fund the retirement benefit," Raines said. He said he is "pretty sure" the town can't borrow money to provide the bonus, but he'd have to confirm that. "Any substantial money that we borrow has to be approved by the state comptroller's office, and there are procedures to do that," Raines said. "Quite frankly, I don't think the state comptroller would go along with borrowing money to pay a longevity bonus." If the board decides to provide the bonus and the town can't borrow the money, it would have to come from some other funding source, like a tax increase. "That's the only mechanism this board has to generate new money," Raines said. "I feel like Jasper owes me and the folks that have been here," Mason said. "We're really kind of bitter about it. It's almost embarrassing what I got. I mean it's embarrassing." She said her lump sum retirement benefit was $53,000 for 22 years of service. "That's what I've got to retire on," Mason said. "If anybody knows where I can invest $53,000 that's going to feed me for the rest of my life after I turn 65, I'd love to know it." Bill Robinson, an attorney in Chattanooga who city leaders hired to help them through the retirement plan transition, said the proposal gives city leaders "a lot of things to think about." "If it's outside the realm of a qualified retirement plan, it's taxable," he said. If the town gave an employee $100,000, for example, that worker would have to pay up to 30 percent taxes on it immediately. "We know that," Mason said. "We've done our homework." Those funds could not be incorporated into a qualified retirement plan. "The board, in my opinion, would have to look at this — find out what the actual rules are regarding whether and to what extent they can make a payment like this," Robinson said. Raines said the proposal would "take quite a bit of work on the board's part" as far as budgetary and legal issues are concerned. "So, there's a lot of questions," he said. Board members said they will work to get answers to questions about the proposal from state officials and will continue to examine it. Mason and Ed Freeman, Jasper's water and sewer superintendent, will represent the city's workers to serve as liaisons while that process continues.